The laundry room project continues. I am still working with the Design Center to find the best cabinet solution. I don't want to pay for custom cabinets so we are trying to find the best solution for my crazy space with out having to pay for modification charges. It is a challenge. In the mean time here are some ideas I have collected using clothes pins. 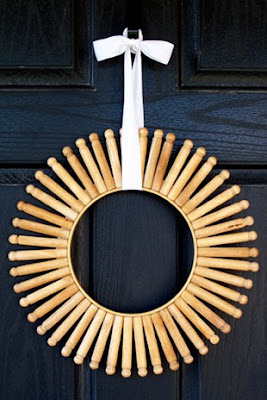 I love this simple wreath idea from the Budget Wise Home Blog. I might have to make one for in my laundry. I am getting ahead of myself for sure. These two beauties in large scale would be fun to have but it looks like they are originally from Pottery Barn and now only available by chance. And my last link is not at all applicable to the location but absolutely made me smile and is theme appropriate. I saw this on Design Milk a couple of weeks ago. 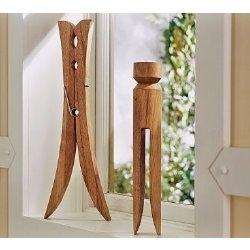 Early in my blogging life I posted about how I enjoy playing with scale in decor. I think it is a great way to add whimsey with style. 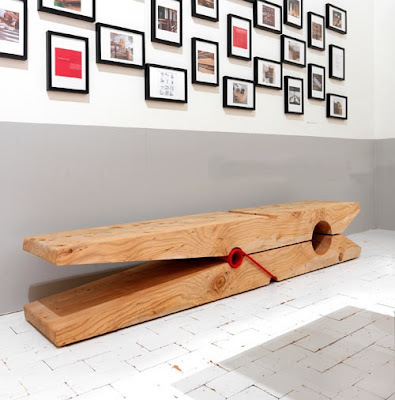 Bench design by Baldessari e Baldessari of Italy.